Finding the right walk in tub bath cushion may be challenging unless you get something made to order or from the original OEM. That’s why Aging Safely offers walk in bath seat cushions exactly how you want it. Simply download the radius chart and let us know the height, width, depth and radius of the corners you need. It’s as simple as that. You can even buy a walk in bathtub seat cushion riser online. Our standard Bath Seat Risers are 3 1/2 inches tall, 1 1/2 inches after compression, and come in custom width and depth dimensions. You can get up to 8″ tall bath pillows on standard orders. All materials inside or out WILL NOT absorb moisture and WILL NOT support mold or mildew. Custom order accepted. Bulk order discounts available. Click here for a free consultation. want your walk in tub to be a little more comfortable? Walk in tub seats may be too hard for some people. We can take the internal measurements of any walk in tub seat and custom make the seat cushion for you. Sometimes being able to sit a higher up on the seat is desired. 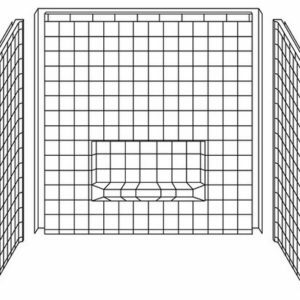 That’s why we offer walk in bath tub seat riser cushions up to 8″ tall for standard orders. Get your new bathtub pillow made how you want it!